Brandwagon has announced local availability of the fitlet2 computer for demanding Internet of Things (IoT) applications. Based on the Intel Atom x7-E3950 processor (of the so-called Apollo Lake processor generation) with up to 16 GB RAM and storage options ranging from eMMC to 2,5” SSD, fitlet2 is a highly versatile miniature PC for IoT. Its functionality can be further extended with second generation Function and Connectivity Extension T-Cards (FACET cards). Like all other Compulab mini-PCs, fitlet2 is completely fanless, operates across a wide temperature range and is sold with a 5-year warranty. 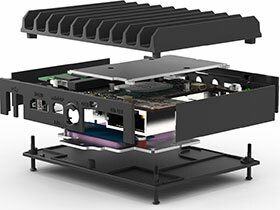 It measures only 112 mm by 84 mm, making it one of the smallest full-featured PCs on the market. An all-metal die-cast housing is used for fanless passive heat dissipation. There are several optional versions of the housing, including a low-profile 25 mm option and an industrial top cover for direct mounting. • FC-LAN with two additional Gbit Ethernet cards (for a total of four). • FC-PCIe and FC-CEM with support for both 4G cellular modem and Wi-Fi that, together with dual Gbit Ethernet, makes a capable miniature IoT gateway. • FC-USB adds four USB ports for a total of eight. Additional FACET cards are under development, including ones for making filtet2 a Power over Ethernet (PoE) powered device, one for integrating a 2,5” HDD/SSD and one for optical LAN. Wired networking is implemented by 2 to 4 Intel I211 Gbit Ethernet ports, while wireless networking includes a modular Wi-Fi adaptor and 4G cellular modem adaptor that can be installed together. fitlet2 supports dual-head 4K displays. Other I/O includes 4 to 8 USB ports including 2x USB 3.0, audio line-out, line-in and S/PDIF, a serial port and micro-SD socket. The PC incorporates various design elements tailored for IoT requirements, such as input power tolerance of 8 V to 36 V d.c., automatic boot on power resume, BIOS settings that are saved to Flash memory, operation without an RTC battery, power button disable and remote power-button connector, and optional TPM. fitlet2 has multiple mounting and deployment options, including VESA and DIN-rail mounting, direct mounting with thermal coupling and an SBC model. This flexibility together with the inherent small footprint simplifies integration of fitlet2 in scenarios such as automotive, transportation, utility, industrial, retail and supply chain IoT applications.